When you register using your school email account (e.g. Albert.Einstein@yourschool.edu) LectureMonkey adds you to your school’s domain. Once part of a domain , you can see other lectures recorded in that domain (i.e. at your school), and your lectures are automatically shared with other schoolmates. This of course doesn’t work if you use a generic email domain like gmail or yahoomail. That is why we recommend using your school’s email – don’t you want to share with your schoolmates, and benefit from their recordings as well? You can change your share default in the settings screen by changing “Share Lectures” to either “Private”, “University” – the default, or”Public”. 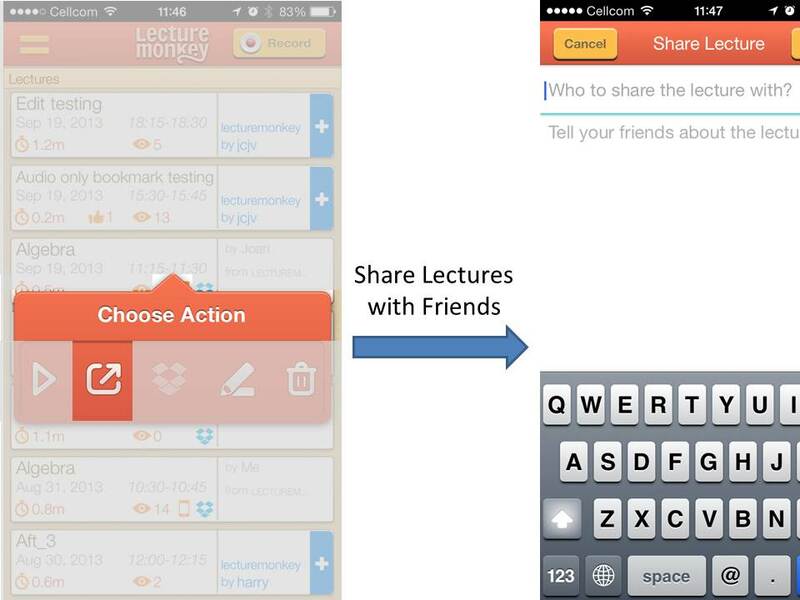 You can also manually share a lecture by selecting the lectures “share” icon and then selecting the email addresses, or lecturemonkey names of the classmates you want to share with. This entry was posted in 1. Using LectureMonkey, Sharing. Bookmark the permalink.